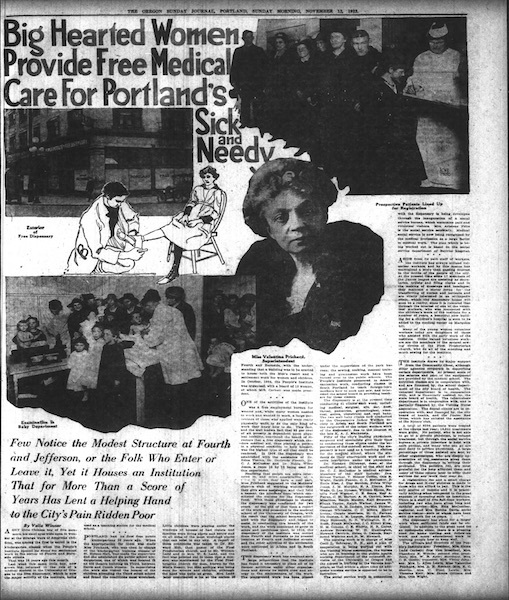 The Portland Free Dispensary was a vital establishment that provided medical care to Portlanders who could not otherwise afford health care and medical attention in times of need. 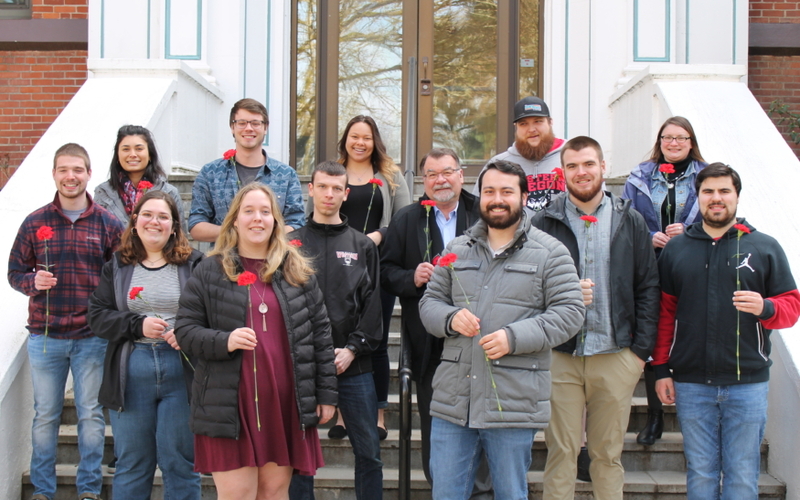 Valentine Prichard, the director of the Portland Free Dispensary, gave her time not only to the ill, but to other charitable causes she felt drawn to. The Free Dispensary was where most of her efforts were directed. Prichard had no medical background but worked as an administrator and sought to provide health care access for her community’s well-being. The Free Dispensary was founded during the fight for woman suffrage. 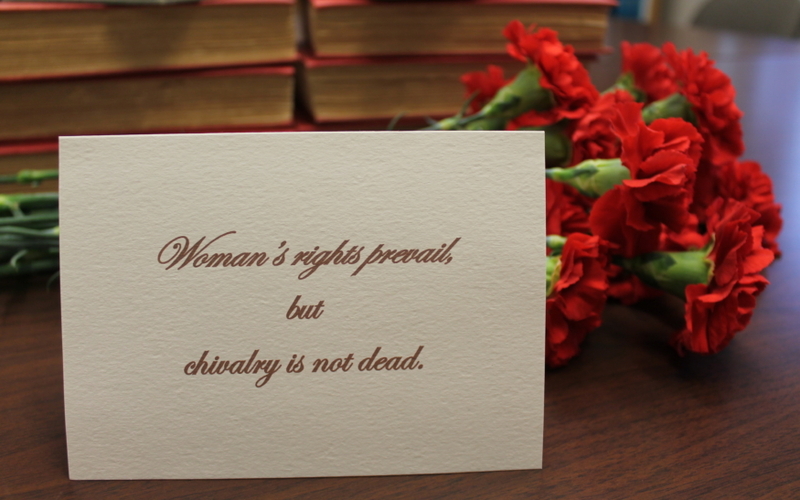 Along with this came the emergence of many powerful women like Valentine Prichard. As Geoffrey B. Wexler noted in the finding aid to her papers at the Oregon Historical Society Research Library, Prichard was born in 1862 in Massachusetts and educated in Illinois where she obtained her Bachelor’s Degree in Public Health. She came to Portland after spending her twenties in California. Prichard quickly became involved in the community and advocated for the betterment of the poor conditions the city’s low-income children were experiencing through the kindergarten movement. As Oregon Health and Science University noted in the online exhibit The People’s Institute and the Portland Free Dispensary, in 1904 Prichard was a supervisor of the Portland Public School kindergartens and joined with other noteworthy locals Helen Ladd Corbett and Caroline Ladd, to establish the People’s Institute Settlement Work. The goal: to serve the low-income population of Portland. Three years later they founded the Portland Free Dispensary to meet the high demand for health care. Soon after, in 1909, medical students from the University of Oregon Medical school joined volunteer physicians to serve at the clinics. 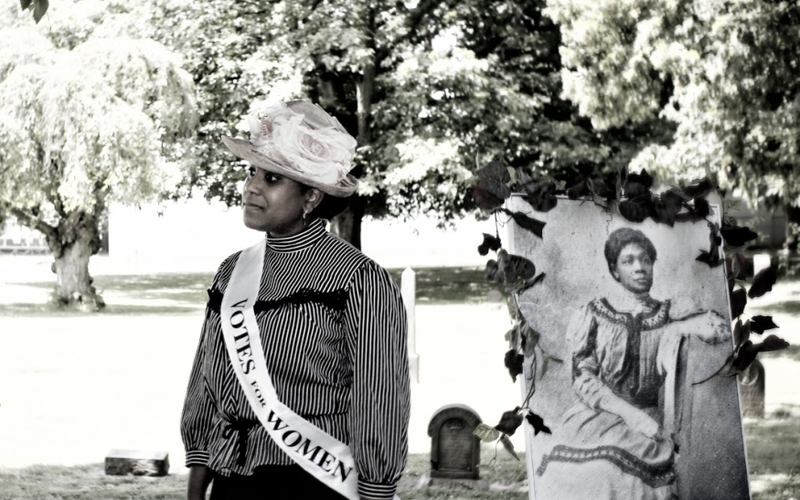 The community that evolved through the movement that took place during this fight for the right to vote paved the way for connections and advancements in several fields including the field of medicine. “A Modern Health Crusade, Oregon Journal, April 10, 1921, Magazine Section: 3. As noted in the Oregon Sunday Journal’s article on April 10, 1921 the Portland Free Dispensary stemmed from the need to provide care for refugees after the San Francisco earthquake in 1906. At the time the article was written, the dispensary had given 10,158 treatments in the previous 12 months; all of which were-of course-provided for free. The Free Dispensary was on “A Modern Health Crusade” as they built “on the Principle that a healthful city is a hopeful and a happy city and that the right of every man is health.” The dispensary served people of all types: “aged women, crippled men, young mothers with their tiny babes sobbing in pain, little girls in soiled gingham, these sit in orderly array about the reception room of the hospitable infirmary.” During times of pain and anxiety, the editors of the Oregon Sunday Journal reported that, “the atmosphere in the dispensary quarters [was] decidedly cheerful.” This movement remains one of the foundations of free medical facilities today in Oregon and across the country. As the Oregon Health and Science University noted in The People’s Institute and the Portland Free Dispensary, dispensary staff established forty-one clinics, including Oregon’s first well-baby clinics. Not only did the work impact those in need in their community, but their impact spans generations. “Big Hearted Women Provide Free Medical Care,” Oregon Journal, November 12, 1922, Magazine Sec: 5. Prichard served as the Dispensary’s superintendent from its founding. 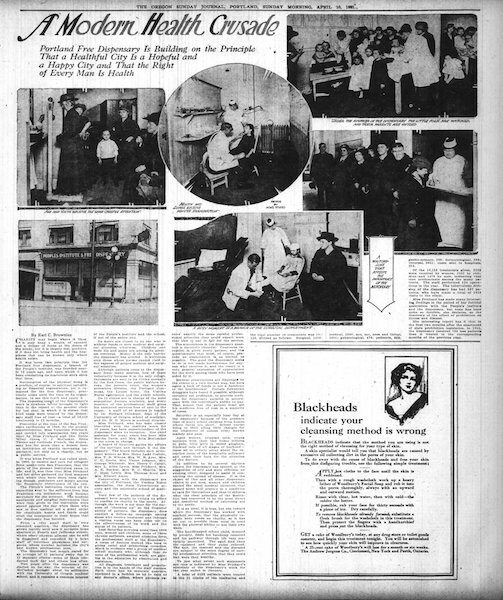 As described in the Oregon Journal on November 12, 1922, “Prichard suggested to the Mothers’ Club—a club of working women—that they give some assistance, and they held a bazaar, the proceeds from which constituted the nucleus for the dispensary fund.” Prichard knew that getting people involved was the key to finding success in a project, and beyond that knew the capacity of power these women held. 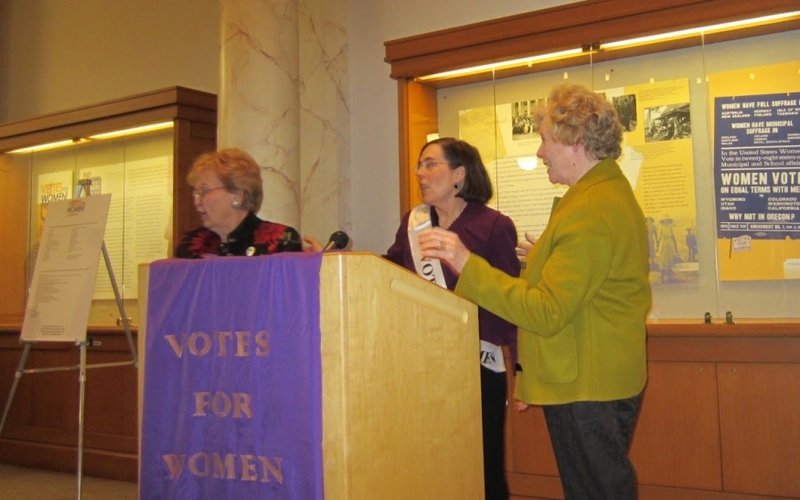 The article recognized that “with these physicians in charge, the dispensary was conducted for two years… a report of the work was presented to the medical school of the University of Oregon, with the result that the school became affiliated with the dispensary and began to assist.” The dispensary’s success in these two years and beyond is due to these women’s dedication and passion for their community’s health. “Women’s Activities,” Morning Oregonian, September 14, 1920, 12. “Women’s Activities,” Morning Oregonian, September 14, 1920, 12 (continued). Valentine Prichard’s work went far beyond facilitating medical care. On September 14, 1920, the Morning Oregonian’s “Women’s Activities” writer described, Prichard’s activity in “Americanization and social welfare work”. “Miss Valentine Pritchard [sic]… recommended that many classes be maintained for teaching the English language. She also outlined the big sisterhood movement for safeguarding young girls, and emphasized the value of friendliness as being the most important factor in all relations.” She advocated for the betterment of oneself and for people helping their community by giving of their own time and knowledge. It is evident here that Prichard’s dedication to community health branched far beyond the medical field. Her commitment and passion for healthcare did not lie in a passion for medicine, but rather a passion for the wellbeing the members of the public. “Chance for Poets Here,” Sunday Oregonian, November 30, 1919, Sec 1:14. Prichard’s commitment to her community spanned across health care, education, and the welfare of children. 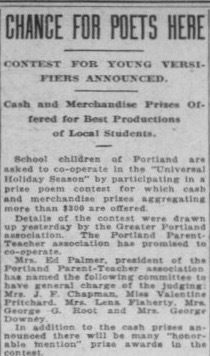 The Sunday Oregonian editors called for the, “school children of Portland… [to participate] in a prize poem contest for which cash and merchandise prizes aggregating more than $200” on the 30th of November, 1919. 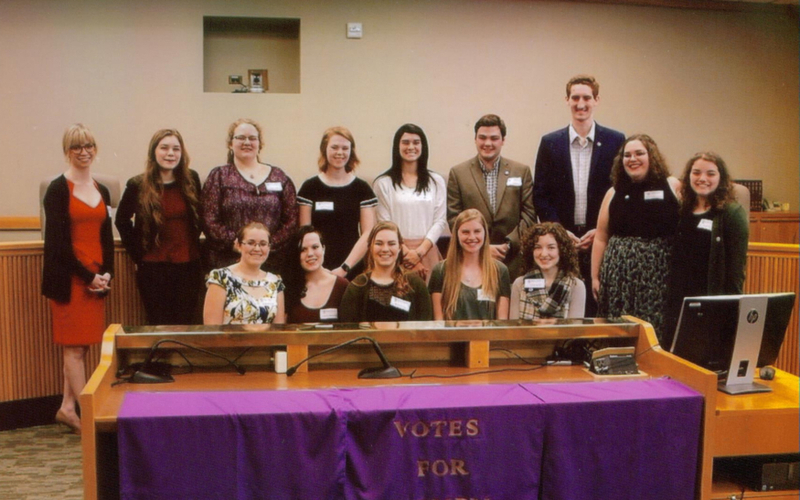 Valentine Prichard was on the committee of judges. She dedicated her time to children both in and out of the Free Dispensary. As Wexler described, “she taught kindergarten in public schools, and eventually she came to Portland, where she was supervisor of the public school kindergartens and principal of a training school for kindergarten teachers at St. Helens Hall. 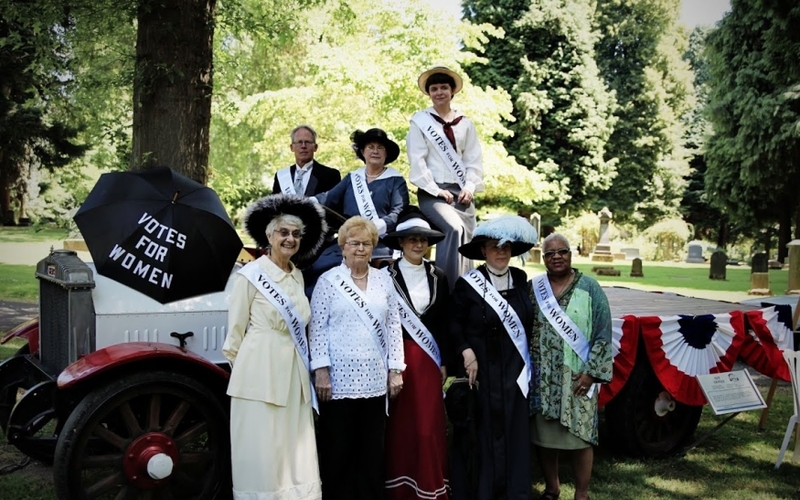 She became involved in local settlement work, and in 1902 presented a report to a group of prominent citizens regarding the miserable conditions of poor children in the city.” Prichard’s focus was social medicine, but it is evident in her expansive efforts towards her community that her range of work reached far and wide in the city of Portland and beyond. Valentine Prichard did more for her community every year than most do in their lifetime. She helped to found the Portland Free Dispensary from the ground up, and saw it flourish. If it weren’t for her hard work and the work of others in the Dispensary, thousands of Oregonians would have gone without adequate medical care, if they received any at all. Beyond her work with the Dispensary she advocated for education and the benefit of children. Looking at Prichard’s background, one might wonder why she chose medicine to be the outlet for her philanthropy; she wasn’t a doctor or nurse, yet her civil and social work was predominantly in this field by way of the Dispensary. My own research is directed towards women’s health and how it has evolved in recent history. While my interests are not specifically aimed at medicine, the field of health care is something I’m passionate about because of the concept of social medicine. 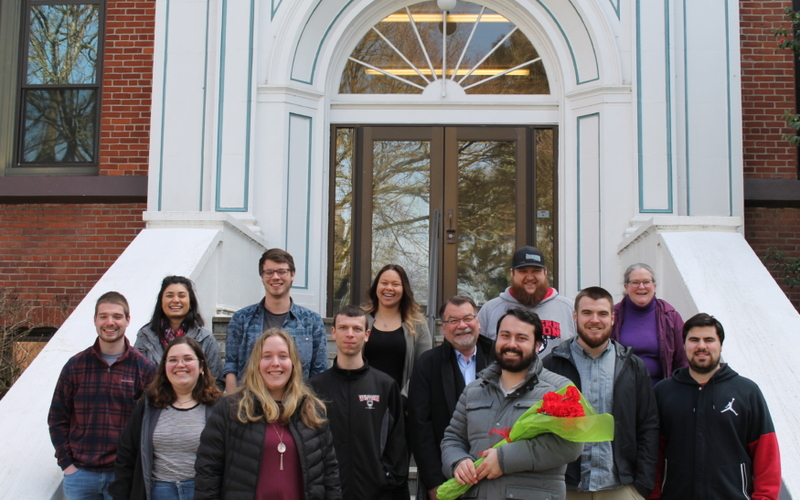 Social medicine’s aim is look to a broader vision of social activism by way of medicine and healthcare. This is similar to the motivation of Prichard’s passion for providing medical care for her community. In a time with no medical insurance, only the wealthy could afford healthcare. Prichard was one of the first generation of activists to make health care accessible to the masses in the Progressive Era. In a time of Medicaid, Planned Parenthood, and free health clinics scattered across the country, this concept is not foreign to us. This was not always the case; however, during this period of advancement, women led the way in making this dream possible. In Oregon’s Doctor to the World Jensen notes that “women physicians in Portland joined other reformers to create… ‘redemptive places’ in the city.” (53) During Prichard’s time, free healthcare was unheard of; but being the humanitarian she was, along with others, she sought to make the right of health her mission. “A Modern Health Crusade, Oregon Journal, April 10, 1921, Magazine Sec:3. Jensen, Kimberly. 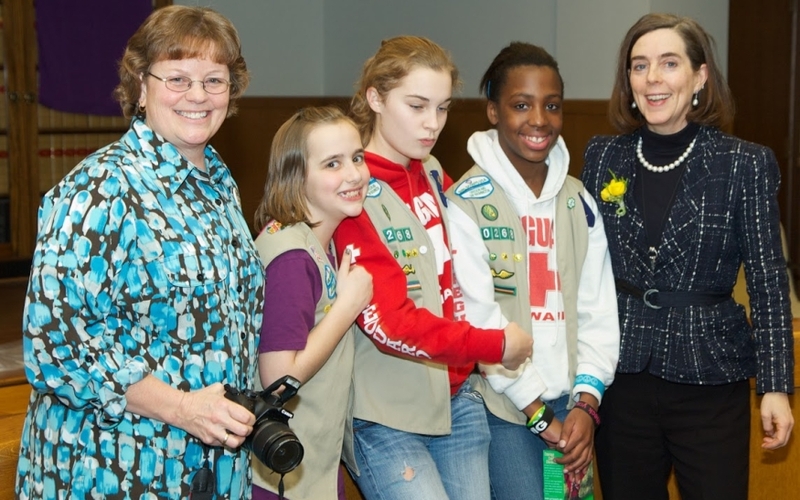 Oregon’s Doctor to the World: Esther Pohl Lovejoy and a Life in Activism. Seattle: University of Washington Press, 2012. 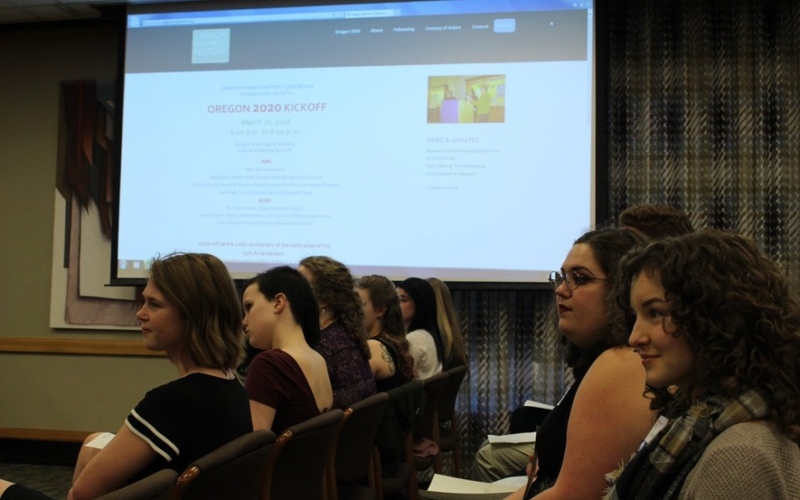 About the Author: Amanda Lehman participated in Professor Kimberly Jensen’s Winter 2018 19th Amendment course as a Senior in the Honors Program at Western Oregon University. She is composing her thesis on women’s health in Jamaica which will be completed Spring 2018. Amanda is a Social Science major and will be studying Social Work at graduate school in Fall 2018.